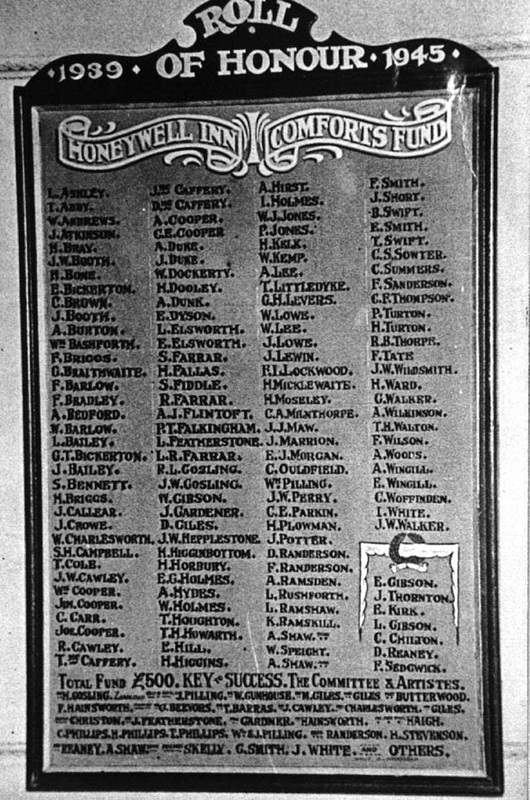 The War Memorial in St Edward the Confessor Church at Kingstone lists 45 who lost their lives in the First World War. Within the boundaries of the parish were several non-conformist chapels and working men's clubs which also had memorials or rolls of honour. For example, Longcar Working Men's Club, on Racecommon Road. The sections of the list are in a downloadable.pdf file and each file contains around 250-300 names. 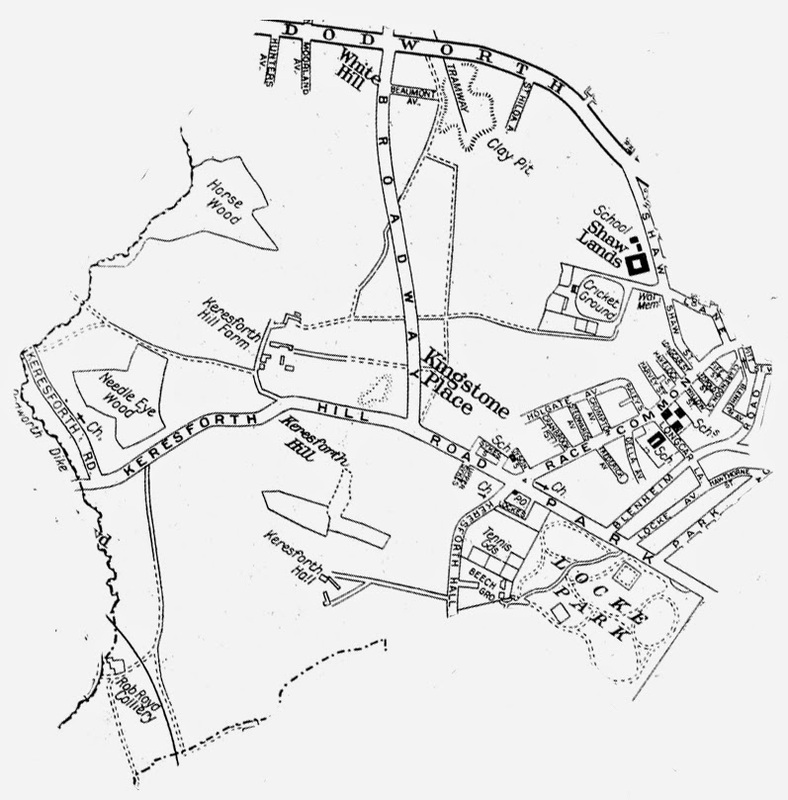 Due to the mismatch between Polling Districts and parish boundaries only streets in the area of St Edward's parish (see map above) have been transcribed. Other streets and parts of streets will be transcribed as part of neighbouring parishes. Some information on this type of memorial can be found in this blog post. NP&UBE stands for National Provincial and Union Bank of England. 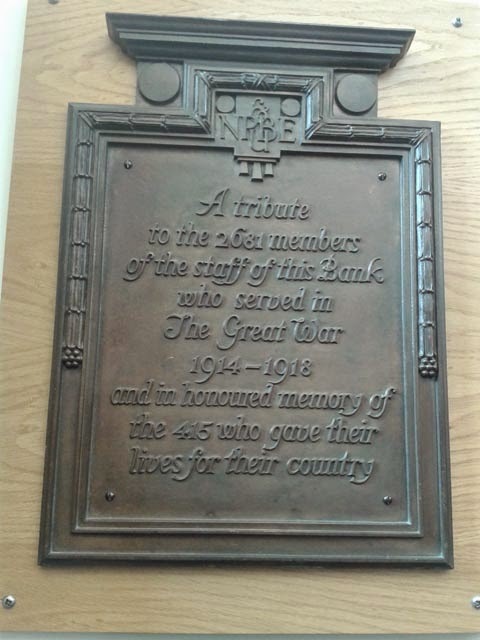 The National Provincial & Union Bank of England plaque was placed in NatWest Barnsley branch as part of the bank's wider memorial repatriation project in 2013. There are four results in a search of their Archives for Barnsley - Thomas Westby, Frank Bakel, Harry Bambridge and Ronald Saville all worked for Union of London & Smiths Bank, and are all remembered on the Holgate Grammar School Old Boys memorial in Barnsley. In 1918, this bank amalgamated with National Provincial Bank of England to form National Provincial & Union Bank of England. A tribute / to the 2681 members / of the staff of this Bank / who served in / The Great War / 1914 - 1918 / and in honoured memory of / the 415 who gave their / lives for their country. Discovered by members of the Great Houghton History Group in a box of old photographs. Does this Roll of Honour still exist? The photo is not quite clear enough to make out all the details in the very bottom section headed, "Total Fund £500. Key to Success. The Committee & Artistes." - this suggests some fund raising by putting on entertainment. The names to the bottom right in the section headed by the wreath may be those who lost their lives. An ongoing search of the local newspapers in Barnsley is giving us evidence of many, now sadly lost war memorials and rolls of honour. From the Barnsley Independent of 1920 comes this report on the unveiling of an unusual Roll of Honour - one dedicated to Plumbers who served in the First World War. There is still a Trades Club on Racecommon Road, but it is an newer building. Did this and possibly other trade specific Rolls of Honour survive the move from one premises to another? Although the report notes that there were 43 men on the Roll it only gives us the names of the two who lost their lives. Joseph Baines who died Jan 2nd 1952 in Sydney Australia aged 52 years / Interred Dodworth Aug 9th 1952 / Also Frank beloved son of the aforesaid / who was killed in Burma Aug 8th 1944 / aged 22 years. Frank is also remembered on the Dodworth War Memorial. He is buried in the Digboi War Cemetery in India and commemorated on the Commonwealth War Graves Commission website. In Loving Memory of James / the beloved husband of Milly Cole / who entered into rest / March6th 1928, aged 72 years / Thy Will Be Done / Also of Milly, wife of the above / who died Sept 1st 1931, aged 73 years / Treasured Memories / Also Harry, eldest son of the above / who was Killed in Action in France / Sept 25th 1916, aged 28 years / Gone but not Forgotten. 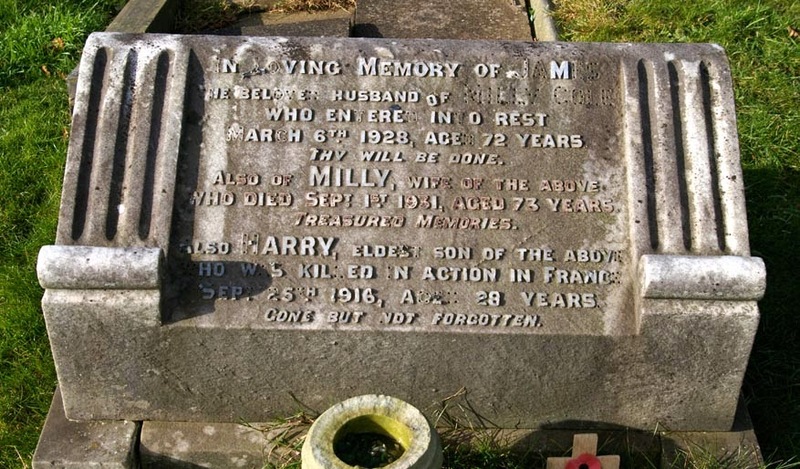 Harry is also remembered on the Dodworth War Memorial. He is remembered on the Thiepval Memorial in France and commemorated on the Commonwealth War Graves Commission website. 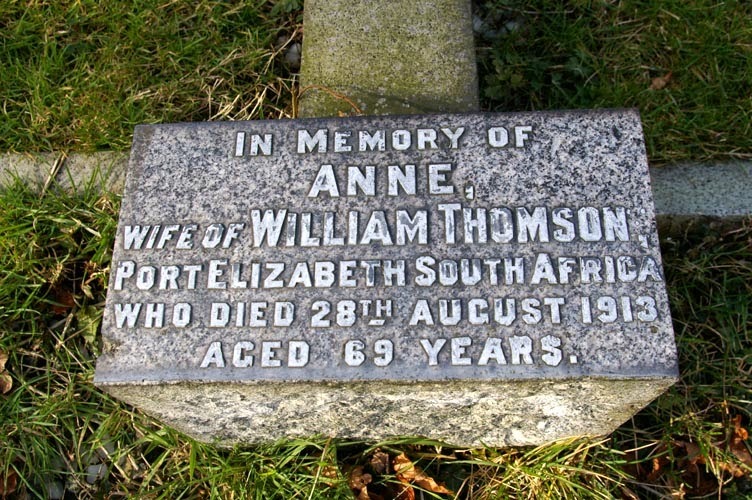 In Memory of / Anne / Wife of William Thomson / Port Elizabeth South Africa / who died 28th August 1913 / aged 69 years / Also of her eldest son / William Alexander / who was killed in Action at the / Sangani River Matebeleland / South Africa on 3rd Decr 1893 / aged 23 years. 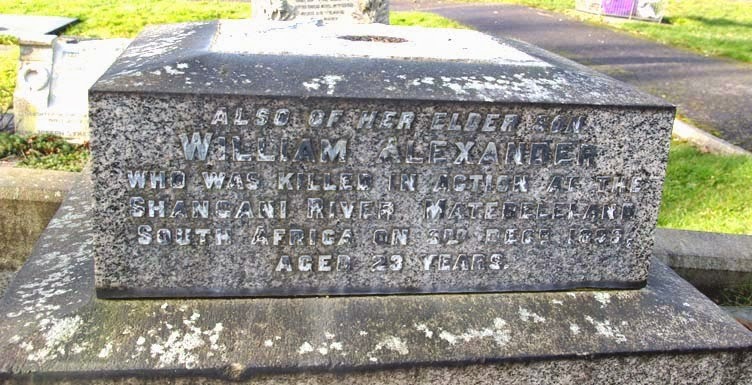 Read more about William online in this book about the Matebele Wars. His connection with Barnsley is that his brother was the doctor in Dodworth for some years and his mother lived at Clayton West until just before her death. 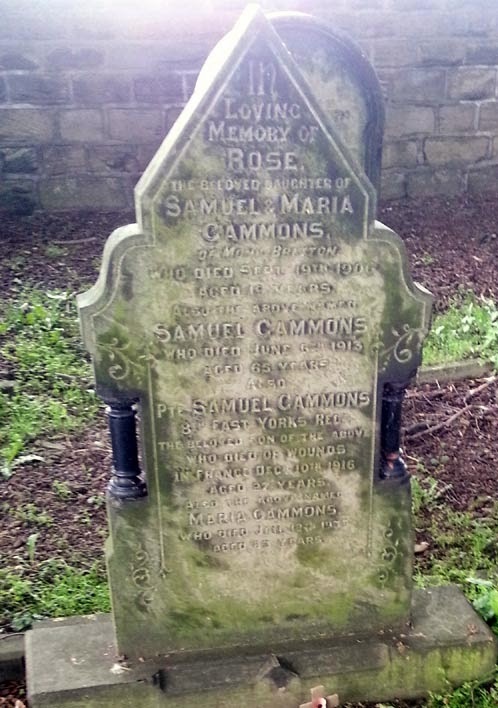 Samuel is also remembered on the Monk Bretton War Memorial, Cross Street. He is buried in Varennes Military Cemetery in France and commemorated on the Commonwealth War Graves Commission website.